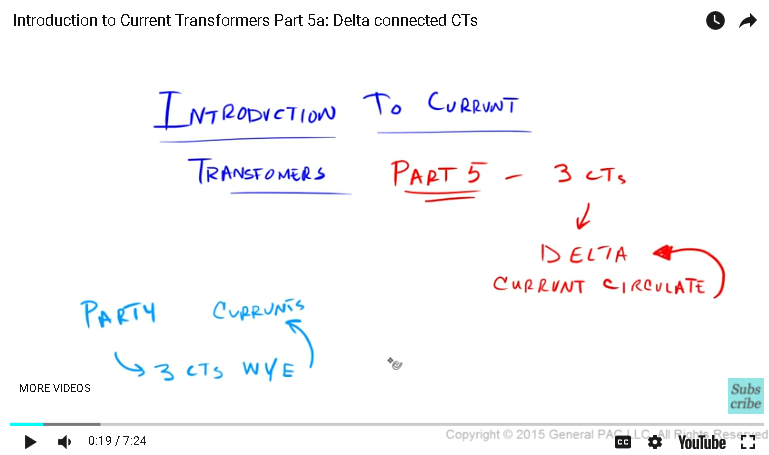 In part four we drew three Cts connected in Y and showed how the current would circulate. 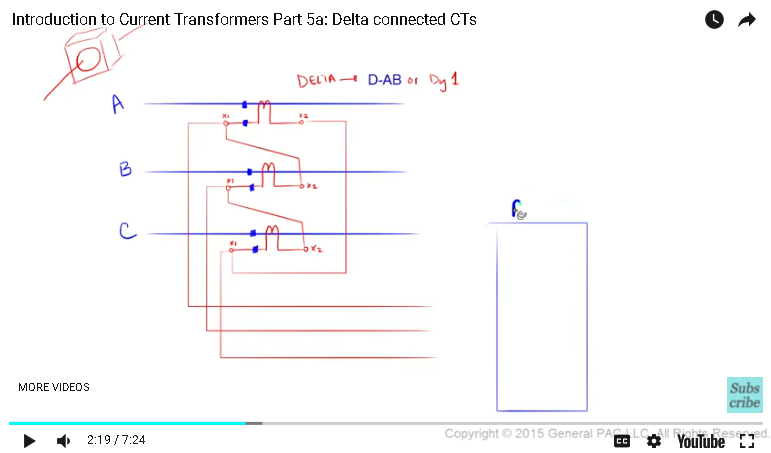 In part five, we're gonna collect three Cts in delta and show how the current would circulate for the delta connection. Okay, so to begin, we're gonna draw three conductors. This is phase A. This is phase B and this is phase C. Let's extend these lines here out a little bit. Okay, so to begin, we're gonna draw a CT that's hooked up like that and think about these CTs as a window type CT like we talked about in the previous part. The window type CT has a window right in the middle of it and the conductor flows right through the window. Okay, so this CT is monitoring current on the phase A conductor. This CT is monitoring current on the phase B conductor and this CT is monitoring current on the phase C conductor. So, let's zoom in here a little bit. Now, consider this side as our X1 bushing and this side as our X2 bushing. Same thing for phase B and phase C. Let's draw this a little better here. Okay, so we're gonna take these three CTs and connect them in delta. 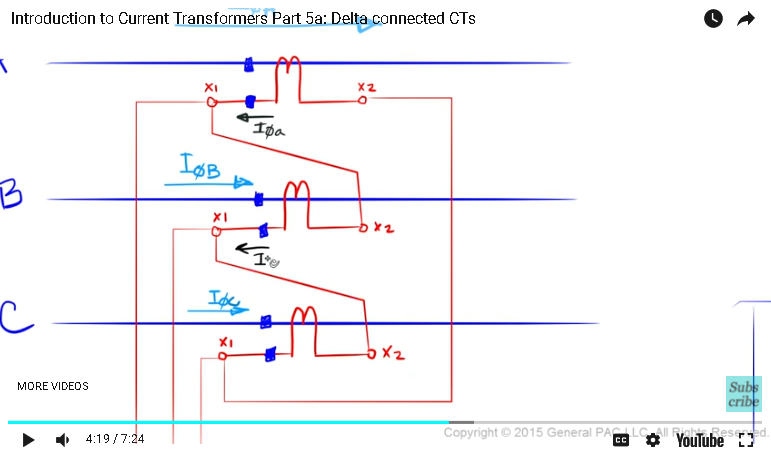 More specifically, we're gonna connect them in the delta A or the DY1 configuration, but before I show how the delta is connected, let's define the polarity marks. So, I'm going to assume the polarity marks are on this side. 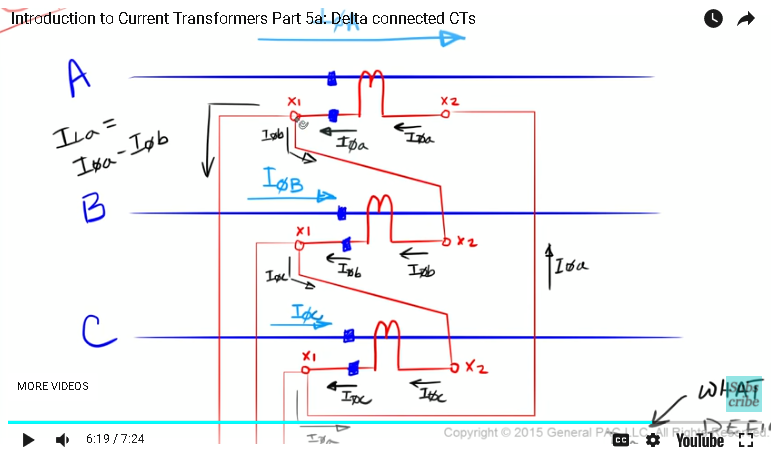 So, to connect these three CTs and the delta connection, we're going to take the polarity side of phase A CT and connect it to the non polarity side of phase B CT, which looks something like this. Similarly, we're going to take the polarity side of phase B CT and connect it to the non polarity side of phase C CT and lastly, we're gonna take the polarity side of phase C CT and connect it to the non polarity side of phase A CT. So, now we're going to connect the X1 bushing of our CTs to our relay, which is gonna look something like this. And our relay is gonna look like this. So, this is our relay. In our relay, we're going to have terminal inputs for phase A, phase B and phase C, which is gonna look like this. And one of these input terminals are going to be marked as the polarity side, so we're gonna now designate this as the polarity side of the input terminal okay. Which means the polarity side of our CT conductor, which is the X1 bushing that we designated here, that's going to be connected to the polarity input terminal of our relay, which is gonna look something like this. Here's phase A, phase B and phase C. Okay, so now what we're gonna do is we're going to connect to the non polarity side of our input terminal in our relay together like this. So, the non polarity side of input terminal A is jumpered to the non polarity side of input terminal B and the non polarity side of input terminal B is jumpered to the non polarity side of input terminal C and the non polarity side of input terminal C is grounded. Now, why we ground this side here like that, is a discussion for a module. But, for now, let's focus on the current flow for delta connected CTs. Okay, so this is how the current is going to flow. The primary current is going to flow from the source to the load. So, here is our primary current for phase A. Our primary current for phase B and our primary current for phase C. Okay, so, since the primary phase A current is going into the dot on the primary side, which means that the secondary phase A current is gonna flow out of the dot on the secondary side, which is gonna look something like this. And then to label this a little bit better, we're going to put a little phase symbol right here. So, again, primary phase A current flows into the dot on the primary side means that the secondary phase A current flows out of the dot on the secondary side. Similarly, secondary phase B current is going to flow out of the dot and secondary phase C current is also going to flow out of the dot. Okay, since secondary phase A current is flowing out of the dot simply means that this is also secondary phase A current, which means that the current flowing in this line, is also secondary phase A current and the current that's flowing like this is also secondary phase A current. Similarly, since secondary phase B current is flowing out of the dot on this side means that this right here is secondary phase B current. And this right here, is also secondary phase B current. Lastly, secondary phase C current flows out of the dot here means that this current here is secondary phase C current and this current here is secondary phase C current. This all makes pretty much sense right. It's just phase current instead of flowing through this delta connection. All right, so the current that's flowing into the polarity side of the relay input terminal for phase A, let's label that current ILA and similarly, let's label this current ILB and this current here, ILC. So, the question is what is this current? What is this? How do we define it. So, ILA if we zoom in here, ILA is simply the current that's flowing in this line here, so it's simply this particular current here. This current is ILA and ILA by [Kirchhof's 00:05:55] current law is the sum of the currents that are flowing into this X1 terminal for phase A CT, which means that since I phase A is going into the X1 bushing and I phase B is leaving the X1 bushing, ILA simply equals I phase A minus I phase B. This makes total sense right? I phase A is coming in. I Phase B is going out, so the current that's flowing in this direction is simply what's coming in minus what's going out. So, this is our relationship here. Similarly, for ILB or the line current B, the line current B equals what's going in to the X1 terminal is I phase B and what's leaving is I phase C and lastly, for ILC current, what's going in is the I phase C current and what's leaving is I phase A. So, essentially, ILA is I phase A minus I phase B. ILB is I phase B minus I phase C and ILC is I phase C minus I phase A.